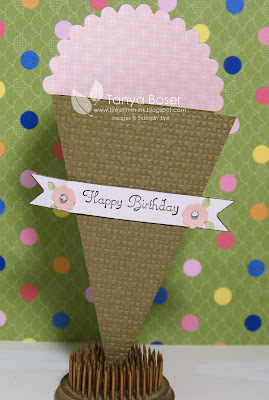 Tinkerin In Ink with Tanya: Birthday Cones! This idea has been floating around the web for a while now, This is just my version of it. I don't know who to credit with the original idea though! Sorry! Turned out super cute and we made these in club on February. 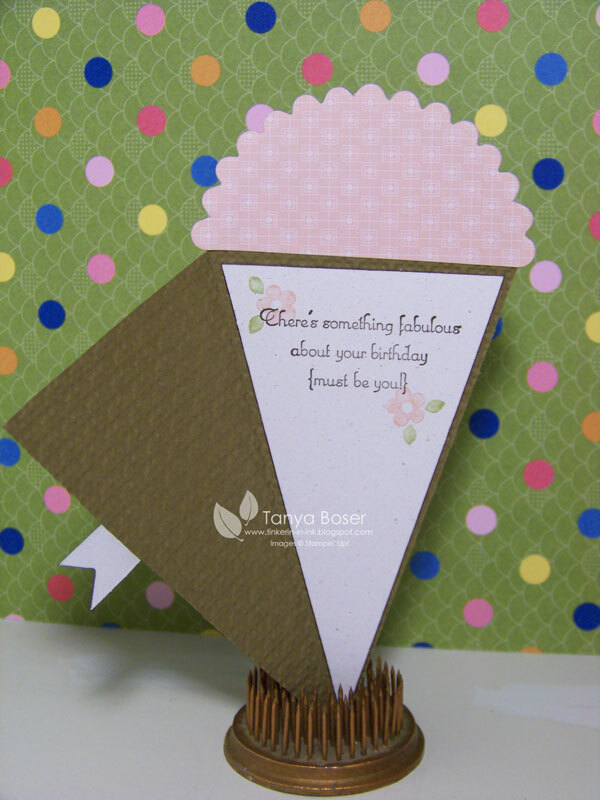 It is made with the Petal Cone die and the Lattice Square embossing folder with a little modification. On the inside I used the same method to make the trimmed triangle as I did for the pennants. Cut a Petal Cone piece in Naturals White. Then I trimmed off the tab on the side. Then folded it in half so there was just one triangular piece showing. Then I trimmed off 1/8" all the way around by lining up the edges with the edge of the silver to the right of the cutting blade on my Fiskars paper trimmer. The little flowers were inked with markers then stamped. I love this sentiment on the inside, so sweet! Have fun making your very own Birthday Cones!! Cute, cute, cute--but who can resist ice cream? How fun!! I may have to share this yummy idea with my club members. Absolutely adorable! Looks good enough to eat! Cute version! The first I heard of it was by BJ Peters in December. So cool, though! Very cute! A great idea!